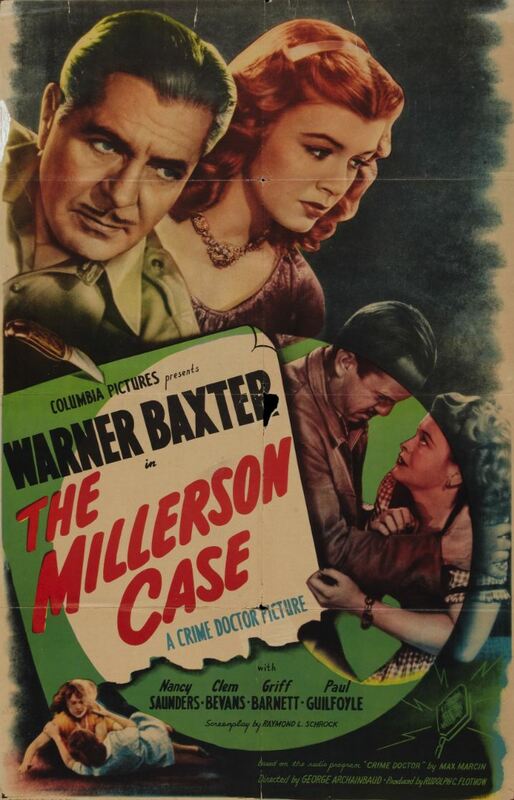 George Archainbaud’s The Millerson Case is the eighth film in the Crime Doctor series from Columbia Pictures and for my money, it’s easily the worst. Produced by Rudolph C. Flothow, the picture finds Dr. Robert Ordway (Warner Baxter) leaving his Manhattan medical office in the incapable hands of his partner, Dr. Shaw (Walden Boyle), and taking a well-earned vacation in the country for some hunting and fishing. After a young man named Eben Tuttle (Elvin Field) is shot while carrying a deer on his back, Dr. Ordway comes face to face with the superstitious and uneducated ways of local physician Sam Millerson (Griff Barnett). When an epidemic of typhoid fever breaks out, Doc Millerson dismisses it as “summer complaint” and treats it with “complaint bitters.” He says that he’s been doctorin’ man and beast for 30 years in these parts and he’ll be damned before anyone else tells him what to do. Three people in the rural community die during the outbreak of typhoid, but one of them, Ward Beechy (Trevor Bardette), has peculiar symptoms. One of the more sensible medical men in the area, Dr. Prescott (Robert Kellard), who’s sent in after the government quarantines the area, isn’t surprised to find evidence of perforated peritonitis in Beechy’s intestinal tract, but he’s never seen a typhoid case with perforations throughout the entire alimentary canal, such as might have been caused by a corrosive poison. Dr. Ordway is unsurprised, since he found no evidence of typhoid bacilli in Beechy’s blood sample and knew something was fishy. This turns out not to be just a typical piece of throwaway hillbilly humor (of which there’s plenty to go around in The Millerson Case). After his death, we learn that Beechy was the local Casanova and had made plenty of enemies — mostly cuckolded husbands and boyfriends who had access to poison. He’s also described as the handsomest man around, which, if you know what Trevor Bardette looks like, should give you some idea of how good-looking the average man in town is. Doc Millerson, who claims he knows who the guilty party is, receives a note in a woman’s handwriting requesting a meeting at the river bank. He goes there and is killed in an ambush by a rifle shot. With only the note as a clue, Dr. Ordway sets out to find the murderer (or murderers) of Beechy and Millerson and set things right. I generally like the Crime Doctor series, and while I didn’t hate The Millerson Case, it was the weakest entry yet. There was too much broad humor for my taste, and the mystery just wasn’t very compelling. Posted in 1947, May 1947 and tagged Addison Richards, Carlton Sand, Clem Bevans, Columbia Pictures, Dwight Caldwell, Elvin Field, George Archainbaud, Gordon Rigby, Griff Barnett, Harold H. MacArthur, Irving Gertz, James Bell, Mark Dennis, Max Marcin, Mystery, Nancy Saunders, Paul Guilfoyle, Philip Tannura, Raymond L. Schrock, Robert Kellard, Rudolph C. Flothow, The Crime Doctor, The Millerson Case, Trevor Bardette, Walden Boyle, Warner Baxter. Bookmark the permalink. Let us bid adieu to Richard Dix. His mention of printed titles is a reference to his early days in Hollywood, when the movies were still silent. Dix had a 30 year-long career, and was one of the first “he-men” of the silver screen; a rugged, square-jawed presence who loomed larger than life. His Whistler films aren’t the best of his career, but they’re nothing to be ashamed of, either. 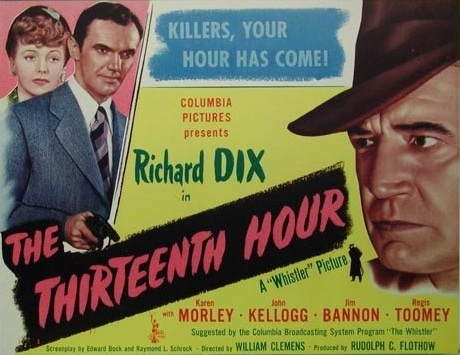 Unlike most of the formulaic, single-character mystery series of the ’40s (e.g., Boston Blackie, the Falcon, the Crime Doctor, Charlie Chan), Dix played a different role in each Whistler film, from the nastiest bad guys to the most well-intentioned good guys. In The Thirteenth Hour, he plays a regular Joe named Steve Reynolds, a truck driver who operates his own trucking firm. He’s engaged to a roadhouse waitress named Eileen (Karen Morley), who has a young son named Tommy (Mark Dennis). After a hot-rodding drunk runs Steve off the road one night and straight into an old man’s gas station, his license is revoked for six months. The accident wasn’t Steve’s fault, but a disappearing witness and a motorcycle cop named Don Parker (Regis Toomey), who has a vendetta against Steve, conspire against him. To make matters worse, Steve has a competitor, Jerry Mason (Jim Bannon), an underworld character who’s undercutting Steve and is determined to run him out of business. Finally, the night comes when Steve’s mechanic and driver Charlie (John Kellogg) is too sick to work, and Steve has no choice but to deliver a shipment himself. His license hasn’t been reinstated yet, so the decision could have terrible consequences. He starts out in the wee hours of the morning and sticks to back roads, but of course, something goes wrong. When he stops to service his truck, he’s knocked out by a masked man. The mysterious figure not only absconds with Steve’s truck, but he uses it to run over and kill a cop. Posted in 1947, February 1947 and tagged Anthony Warde, Arthur Morton, Bernadene Hayes, Charles Jordan, Cliff Clark, Columbia Pictures, Dwight Caldwell, Edward Bock, Ernie Adams, Film Noir, Jack Carrington, Jim Bannon, John Kellogg, Karen Morley, Larry Darmour Productions, Leslie Edgley, Mark Dennis, Mystery, Nancy Saunders, Otto Forrest, Paul Campbell, Raymond L. Schrock, Regis Toomey, Richard Dix, Robert Williams, Rudolph C. Flothow, Selmer Jackson, The 13th Hour, The Thirteenth Hour, The Whistler, Vincent J. Farrar, William Clemens. Bookmark the permalink. George Sherman’s Secret of the Whistler is a solid but unremarkable entry in Columbia Pictures’ series of bottom-of-the-bill programmers based on the radio show The Whistler. Each film in the series starred Richard Dix, a he-man of the silent era whose star was fading. Dix delivered sweaty, paranoid performances in a variety of roles in The Whistler series; businessman, drifter, private investigator, homicidal maniac. His health may have been failing, but he was still a solid performer. In Secret of the Whistler he plays a painter named Ralph Harrison who is living the high life on his wealthy wife’s dime. He throws lavish parties in his studio/bachelor pad for people who aren’t really his friends, but who don’t mind eating his food and drinking his booze. Among the many attractive young women who pose for Harrison for big money is Kay Morrell (Leslie Brooks), a beautiful blonde with gams that won’t quit. Meanwhile, Harrison’s wife, Edith Marie Harrison (Mary Currier), lies in bed at home, at death’s door. When the film begins, Harrison seems to genuinely care for his ailing wife, and she adores him. Slowly but surely, however, Harrison begins to fall for Kay. (And after the scene in which she poses for him wearing a small one-piece undergarment, I thought to myself, “Who wouldn’t?”) He buys her expensive presents and lavishes her with attention. His wife isn’t long for this world, so what’s the harm? The only problem is that Mrs. Harrison comes under the care of a specialist, and makes a miraculous recovery. (Her cardiologist’s course of therapy seems to mostly involve getting out of bed and taking long walks, which is still good advice today.) When she drops by her husband’s studio unannounced, however, her excitement turns to horror when she overhears her husband pitching woo to Kay. She suffers a major setback and promises to write Ralph out of her will. Fans of The Whistler radio show will have no trouble predicting what will happen next, or the panoply of complications that will arise. True to the radio show, the Whistler himself shows up several times in the film, always as a dark silhouette or a shadow thrown on a wall, speaking directly to Harrison and revealing his murderous thoughts. 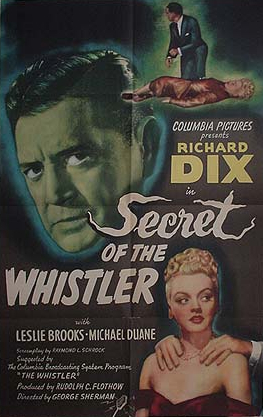 The screenplay for Secret of the Whistler by Richard H. Landau and Raymond L. Schrock is the most thematically similar to the radio show of all the films in the series I’ve seen so far. If murdering your wife was your thing, The Whistler was the best show on the air. Nearly every week it seemed as if someone’s spouse was being bumped off for an inheritance and a chance at life with a younger boyfriend or girlfriend, although things never went according to plan. With a little more than double the running time of a typical episode of the radio show, Secret of the Whistler has more time to develop its characters and its story. On the radio, there just wouldn’t be enough time to show Ralph’s tepid devotion slowly changing to disinterest. At the same time, though, the film feels a little longer than its 65-minute running time, and while its twist ending is good, it doesn’t have the devious ingenuity of the best twists of the radio show. Still, this is a really good mystery series, with heavy doses of noir atmosphere and performances by Dix that are always interesting to watch. Secret of the Whistler is a lesser entry in the series, but it’s still a pretty good one. Posted in 1946, November 1946 and tagged Allen Siegler, Arthur Space, Byron Foulger, Charles Trowbridge, Claire DuBrey, Columbia Pictures, Dwight Caldwell, Film Noir, George Sherman, Herschel Burke Gilbert, Jack Davis, John Hamilton, Larry Darmour Productions, Leslie Brooks, Mary Currier, Michael Duane, Mischa Bakaleinikoff, Mona Barrie, Otto Forrest, Ray Walker, Raymond L. Schrock, Richard Dix, Richard H. Landau, Rudolph C. Flothow, The Secret of the Whistler, The Whistler. Bookmark the permalink. If you needed a giant primate in Hollywood in the ’40s, Ray “Crash” Corrigan was your go-to guy. Corrigan would put on any ape costume for a paycheck. And if you didn’t have a particular vision of what your giant primate should look like, Corrigan was happy to wear his own fitted ape suit that was covered with “fur” made of human hair. He even did children’s parties and reportedly terrified some kids. Nicknamed “Crash” for the way he tackled other football players and for his fighting skills, Corrigan got his start in Hollywood as a physical trainer to the stars, as well as performing stuntwork and acting in bit parts, such as his appearances in an ape costume in Tarzan and His Mate (1934) and as an “Orangopoid” in the Flash Gordon serial (1936). He got his big break playing a human when he was picked to star in the Republic serial Undersea Kingdom in 1936, after which he was signed as a term player for Republic Pictures. He eventually left over a pay dispute and went to Monogram Pictures. He appeared in more than 50 movies in the late ’30s and early ’40s (including 24 outings as “Tucson Smith” in Republic’s “Three Mesquiteers” series and 20 appearances as “Crash Corrigan” in Monogram’s “Range Busters” series), but even during this fertile period of his career playing humans, he frequently found himself in monkey suits. And no, that’s not a euphemism for tuxedos. He appeared as a gorilla or ape in Round-Up Time in Texas (1937), the Three Stooges short “Three Missing Links” (1938), the Boris Karloff horror film The Ape (1940), Law of the Jungle (1942), The Strange Case of Doctor Rx (1942), Dr. Renault’s Secret (1942), Captive Wild Woman (1943), She’s for Me (1943), Nabonga (1944), The Monster Maker (1944), and The Monster and the Ape (1945). He even did double duty in some films. In the Three Mesquiteers film Three Texas Steers (1939), he appeared not only as his recurring character Tucson Smith, but also as “Willie the Gorilla.” And in The White Gorilla (1945), he played not only the hero, but also “Konga,” the white gorilla whom the hero fights. There’s so much to work with already I don’t know where to start. The combination of the verb “penetrate” with the noun “virgin territory,” the fact that “Negritos” are ethnic groups in Southeast Asia, the idea that any village inhabited by humans would be “nameless.” The only thing the film sort of gets right is the general location where gorillas live. Once the wielder of the pointer calms down and focuses on the area where the Atlantic Ocean feeds into the Congo, that is. 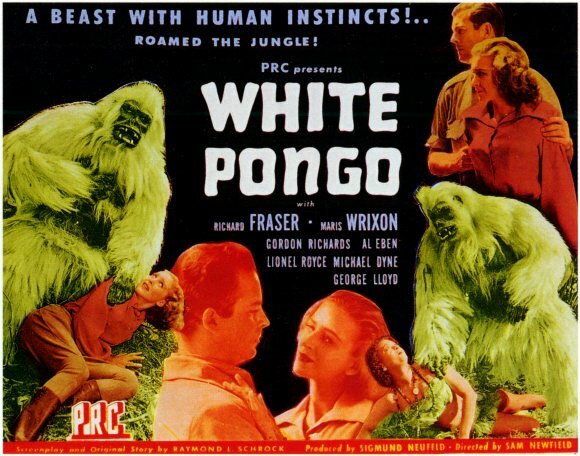 The plot of the film, such as it is, involves a crew of scientists and hunters who are hot to find the white ponga because if he turns out not to be a hoax, he could be the “missing link that will prove Darwin’s theory.” Why they believe this despite having no direct contact with the creature is not explained. Because he has white fur? The mind reels. The leader of the expedition, Sir Harry Bragdon (Gordon Richards), of course brings along his beautiful blond daughter, Pamela (Maris Wrixon). The most watchable scenes in White Pongo are the ones she shares with the great white hunter of the expedition, Geoffrey Bishop (Richard Fraser), who’s believable in his role as a tall, lean, Rhodesian rifleman (even though he’s a Scot with an accent that sounds British). Unfortunately, there’s also an unnecessary triangle involving a twit named Clive Carswell (Michael Dyne) who fancies himself in love with Pamela, even though she has no interest in him. At just under 72 minutes, the film still drags. There seems to be more stock footage, travelling scenes, and establishing shots than there are scenes that advance the story. Things don’t really pick up until the last 15 minutes, which are fairly brisk, though still not what I would call “action-packed.” For a guy who made wearing an ape costume a vocation, Corrigan doesn’t really move or act like a primate, making his large role in the climax more laughable than anything else. And the frequently interspersed stock footage of actual monkeys doesn’t help. Unless you have a fetish for humans in gorilla suits, you can pass this one up with a clear conscience. Posted in 1945, November 1945, October 1945 and tagged Action-Adventure, Al Eben, Bert Sternbach, Egon Brecher, George Lloyd, Gordon Richards, Holbrook N. Todd, Jack Greenhalgh, Joel Fluellen, Larry Steers, Leo Erdody, Lionel Royce, Maris Wrixon, Michael Dyne, Milton Kibbee, P.R.C., Ray Corrigan, Ray Mercer, Raymond L. Schrock, Richard Fraser, Sam Newfield, Sigmund Neufeld, White Pongo. Bookmark the permalink. This movie is sort of like Weekend at Bernie’s, if the object in that film had been to keep Bernie’s body hidden and constantly on the move so no one could find it. J. Edward Bromberg, a hard-working character actor, gets a rare chance to star in a film. He plays an upstanding newspaper publisher named Henry Kruger who threatens rival publisher Andy McDonald (played by Paul Guilfoyle) after McDonald splashes a tawdry story about Kruger’s daughter all over the front page of his daily paper. McDonald turns out to also be a blackmail magnate, and when one of his victims rubs him out, his body winds up in the trunk of Kruger’s car. Most of the film involves the increasingly perplexed Kruger’s attempts to deep-six the body so he won’t be accused of a crime he didn’t commit. The only problem is, the body won’t stay in one place for very long. Who’s moving it? And why? The Missing Corpse is a fun mix of comedy and suspense. Like most of the output from P.R.C., it’s a quick, low-budget diversion, and little more, but it’s still a light-hearted and fun hour and one minute. As far as MacGuffins go, a dead body is a pretty good one, and P.R.C. certainly released worse films into theaters in the ’40s. Posted in 1945, June 1945 and tagged Albert Herman, Anne O'Neal, Archie Twitchell, Ben Welden, Charles Coleman, Eddy Waller, Elayne Adams, Eric Sinclair, Frank Jenks, Harry O. Hoyt, Isabel Randolph, Isabel Withers, J. Edward Bromberg, James S. Brown Jr., John Shay, Karl Hajos, Ken Terrell, Leon Fromkess, Martin Mooney, Mystery, P.R.C., Paul Guilfoyle, Raymond L. Schrock, The Missing Corpse, W. Donn Hayes. Bookmark the permalink.